The festival season, which starts in August, is the best period for commodity investors. It starts with Raksha Bandhan and ends with Diwali. This is followed by the peak marriage season. High demand in this period generally leads to fi rming of prices of many agricultural products and precious metals. 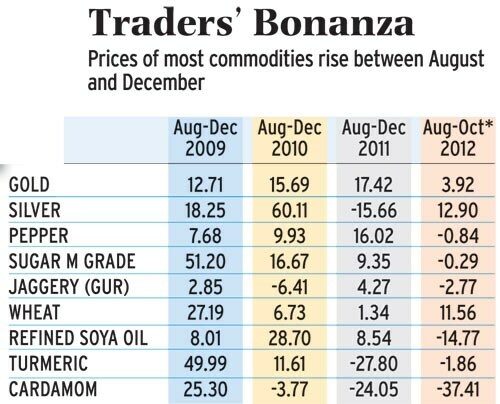 Most of these commodities give positive returns if the investments are made at the right time. For instance, between August and December 2011, gold rose over 17 per cent on NCDEX, followed by pepper (16 per cent), sugar (9 per cent), refi ned soya oil (8.5 per cent), gur (4.3 per cent) and wheat (1.3 per cent). 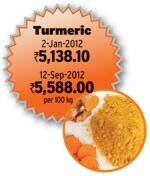 However, silver, cardamom and turmeric fell 15.6 per cent, 24 per cent and 27.8 per cent respectively. A similar trend was evident in 2010 and 2009 (See Traders' Bonanza). Dharmesh Bhatia, Associate Vice President, Research, Kotak Commodities, is positive about this year too. "The market will be bullish on most commodities due to festive demand," he says. 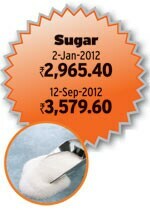 Farm Products Sugar: Sugar rose from Rs 2,700 per quintal in August 2011 to Rs 2,952 in December 2011. Since June this year, it has risen 22 per cent, due to the deficient monsoon. (It was at Rs 3,497 a quintal on August 25.) But prices will not rise indefi nitely. After a dry July, vast areas of the country, including western Uttar Pradesh, India's key sugarcane belt, got good rainfall in August. The area under sugarcane has also increased and farmers are expecting production to rise. If the weather stays favourable, the country may produce more sugarcane this year. "During September-October, NCDEX sugar futures may trade at Rs 3,350-Rs 3,650 per quintal due to festive demand, but in November-December the price may touch Rs 3,150 and thereafter Rs 3,025 per quintal," says Ajitesh Mullick, Assistant Vice President, Retail Research, Religare Broking. Refined Soya Oil: Palm oil and soyabean oil account for 68 per cent of the global edible oil trade, with soyabean oil accounting for a 22 per cent share. Due to concerns over corn and soyabean output in the US, which is facing its worst drought in over 50 years, and defi cient rainfall in India, refi ned soya oil prices have risen over eight per cent since the start of the year. In 2012, prices of refined soya oil futures have remained at Rs 700-815 per 10 kg. Experts say domestic production of soyabean oilseeds was 11,000 million tonnes in 2011. In 2012, it is expected to be 11,400 million tonnes. Consumption was 2,745 million tonnes in 2011. In 2012, it is expected to rise marginally to 2,850 million tonnes. Renisha Chainani, Commodity Analyst, Capital Markets (individual clients), Edelweiss Financial Services, says: "The next four months account for 30 to 40 per cent of the annual demand. Prices are expected to remain within the Rs 770-850 per 10 kg range." Sudip Bandyopadhyay, MD and CEO, Destimoney Securities, sets his forecast a little higher. "Global supply will remain limited due to bad weather. If prices break past the recent high of Rs 814 per 10 kg on a closing basis, they can shoot up to Rs 900 per 10 kg by year-end," he says. Wheat: A combination of factors, such as high demand, fear of drought and high procurement by the government have pushed up prices by over 31 per cent to Rs 1,600 a quintal this year. Drought in the US and fears that Russia and Ukraine may ban exports have hit supply and led to fi rm prices. "Severe shortage that mill owners have been facing has resulted in a 30 to 35 per cent rise in prices of wheat-based products in the last one month. We generally see a 10 to 15 per cent increase in demand. 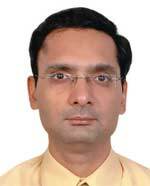 Prices are likely to rise to Rs 1,950 a quintal by end-2012," says Ashok Mittal, CEO, Emkay Commotrade. Jaggery: Jagggery (gur) is made from sugarcane. Due to lower estimated production and poor rainfall, gur prices hit a high of Rs 1,209 per 40 kg in July. However, between August 1 and September 4, they fell four per cent to Rs 1,131. Harish Galipelli, Head, Commodity and Currency Derivatives, JRG Wealth Management, says: "Improved acreage due to rain in later months of the monsoon season may ease some concerns. Gur prices may stay in the range of Rs 1,100 to Rs 1,250 for the next one or two months." There is a rise in demand for most spices during the festival season. However, consumption varies. Turmeric: Prices of turmeric, which had fallen sharply due to a good crop in 2011/12, have started rising now due to low rainfall and fall in acreage. During last year's festive season, prices had fallen 25 per cent. 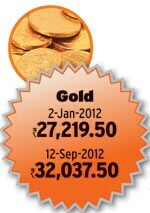 Till September 2012, they have risen seven per cent to Rs 5,497. Traders are expecting production to be low at four to fi ve million bags (one bag is equal to 70 kg) as against eight to 8.2 million bags last year. Naveen Mathur, Associate Director, Commodities and Currencies, Angel Broking, says: "We expect turmeric to touch Rs 7,500 per quintal." Black Pepper: Prices, which have fallen since the second week of August due to imports and low demand for the Indian variety, may bounce back as demand recovers before the festive season. 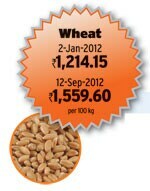 From the start of the year to July 2012, prices rose 26 per cent to Rs 42,247 per quintal. However, between August 13 and September 9, there was a 5.3 per cent fall to Rs 40,823 per quintal. Experts are bullish on account of festive season and export demand. C.P. Krishnan, Whole-time Director, Geojit Comtrade, says: "Pepper, cardamom and turmeric will see upward price movement during the festive season. 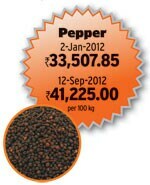 In 2012, pepper is likely to trade at Rs 44,000 per quintal." Cardamom: Since the last week of July, October futures of cardamom on MCX have slid over 21 per cent. They were at Rs 1,035 per kg on September 3. However, it seems prices may recover gradually due to festive season demand and poor rainfall in Kerala, which accounts for 78 per cent of the country's production. Diwali is preceded by Dhanteras, when buying gold and silver is considered auspicious. However, Amarsingh Deo, Head of Commodities and Currency, Aditya Birla Money, says: "The demand for gold and silver may not be robust. Drought in many areas of the country will affect rural incomes." Rural India accounts for more than 60 per cent demand for gold. According to the World Gold Council, gold investment and jewellery demand in India fell to 181 tonnes in the second quarter of 2012, down from 294 tonnes during the same period last year. Vivek Gupta, Head of Research, CapitalVia Global Research, is also bullish on gold and silver. 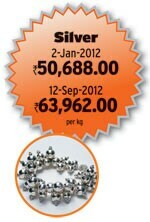 "On the MCX, silver will test Rs 66,500 to 66,850 levels. If it crosses Rs 67,000 it will see the highs of Rs 72,000 and Rs 73,000 again," he says.